We here at Entertainment Maven, in our attempt to bring you informed reviews of theatrical releases, home entertainment and special events, have decided that it’s time to acknowledge one of the largest growing forms of entertainment in the world. Of course what I am talking about is Mixed Martial Arts, and in particular the UFC. Now we will not be getting into live event coverage, there are plenty of avenues which cover the live events as they happen or shortly after, and while we do cover events we have decided they will be film related only at this time. So why are we going to be reviewing UFC DVDs? Because there are only a handful of sites out there doing reviews of the actual DVD releases from UFC. Many fans can’t afford to pay out over $60 a month for pay-per-view events and wait for the DVD releases to see the full card. Also, there are some events you just need to own. These reviews will come in a DVD review format, only slightly different from our other DVD reviews, where we will discuss the main program (card) and list and discuss the special features for the disc. Then we will ultimately give our opinion on whether it’s worth your hard earned money. Now let’s step into the octagon for UFC 143! UFC 143 was a card, like a good few these days, which saw a lot of turmoil. The Card was originally scheduled to be Nick Diaz vs Georges St. Pierre (GSP) after Carlos Condit stepped aside from the fight with GSP he was originally in line for. Condit was put into this main event for the Interim Championship after a training injury sidelined GSP for over 6 months. Condit’s original opponent Josh Koscheck was rescheduled to fight Mike Pierce. The first disc of this 2 disc set features the pay-per-view card in its entirety. The Main Event Card goes as follows – Diaz vs. Condit / Roy Nelson vs. Fabricio Wredum / Koscheck vs. Pierce / Renan Barao vs. Scott Jorgenson / and Ed Herman vs. Clifford Starks. The Main Card ultimately leaves us feeling a little flat. With only one fight ending with a stoppage the judges were busy in Vegas that night. 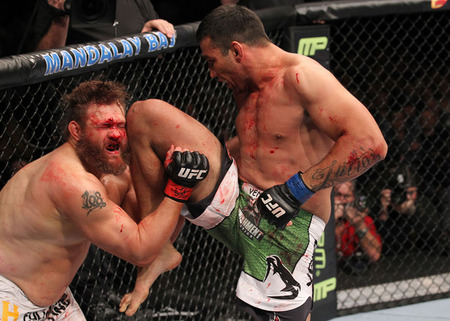 The Nelson/Verdum fight is a bloody affair with both fighters going all out in by far the most entertaining bout. Conversely the Condit/Diaz fight is dull with a lot of posturing and striking at distance with very little grappling until round 5 and more jabs than dangerous strikes. The fight has become more infamous for Nick Diaz’s tirade after the fight and his “retirement” from MMA in the post-fight interview. The 2nd disc has all the preliminary fights and special features. Prelim line up is as follows – Dustin Poirier vs. Max Holloway / Alex Caceres aka Bruce Leroy vs. Edwin Figueroa / Matt Brown vs. Chris Cope / Matthew Riddle vs. Henry Martinez / Rafeal Natal vs. Michael Kuiper / and Dan Stittgen vs. Stephen Thompson. Of the Prelim fights the standouts are the Stittgen vs. Thompson bout for a killer KO, Matt Brown vs. Chris Cope and Dustin Poirier vs. Max Holloway for a great submission. The most bizarre fight was Caceres vs. Figueroa as illegal blow deductions impact the result of the decision dramatically. For special features we get the return of the excellent Countdown to UFC programme. Given the level of bravado coming from the two headliners it certainly turned into a fun countdown show, and having Roy Nelson on it never hurts. We also get a behind the scenes short film and the complete broadcast of the official weigh-ins. 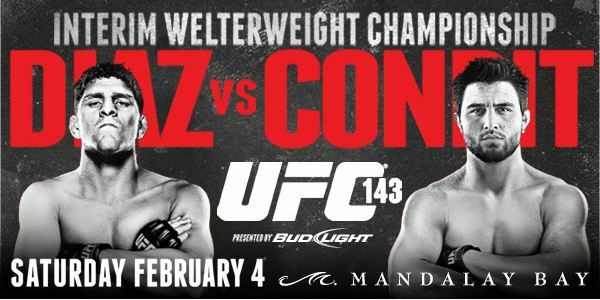 Ultimately UFC 143 Diaz vs. Condit is one of the UFC releases you might want to skip. With so many great cards and discs out from the UFC, and many more on the way soon, 143 is really only for completest and hard-core fans of the fighters on the card.